Weighty Matters: England's health officials continue to prove they're among the dumbest in the world. England's health officials continue to prove they're among the dumbest in the world. Hat tip to my friend and colleague Arya Sharma for his tweet which pointed me to the latest from across the pond. 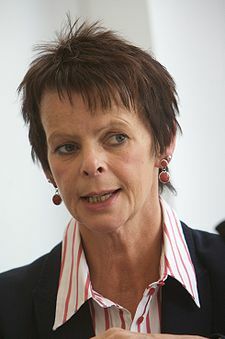 Apparently Anne Milton (pictured up above) the British parliamentary under-secretary of state for health, has called upon GPs to start calling their patients "fat" so as to "inspire" them to take, "personal responsibility" for their weight. Of course the notion that obesity is a disease of the individual, of "personal responsibility" and not a disease of a toxic, obesogenic environment is one near and dear to the food industry's so-called heart. - There's no such thing as a bad food. - Obesity is caused by inactivity and treated through exercise. - It's about "balancing" energy in vs. energy out. - It's about taking "personal responsibility". And lately British health officials have been singing all four. I know I have some British readers and wondering if you folks might know - is there a transparent means whereby money spent by the food industry lobby on your politicians can be tracked? Given what's come out of the mouths of your officials these past 2 years, I'd be willing to wager tens of millions of pounds are involved. Jan. 2009 - England's government launches 3 year "Change4Life", food industry funded and government overseen program replete with useless messages of the, "Eat less, exercise more" camp with emphasis on the "exercise more". June 2010 - England's Health Minister Andrew Lansley slams Jamie Oliver inspired school lunches campaign that led to the removal of processed garbage from middle schools. July 2010 - England's Health Minister Andrew Lansley spews the food industry party lines of, "there's no such thing as a bad food", to the Faculty of Public Health in London while informing them of the British government's divestment of any involvement in Change4Life. He then tells them he's turning over direct control of Change4Life to the food industry and in return for their continued funding he's promised not to regulate them. July 2010 - England strips their Food Standards Agency (FSA) of their food labeling responsibilities because they had been pressing for the adoption of front-of-package traffic light labeling. Now that labeling's been formally returned to the hands of industry's best friend Andrew Lansley, guess what? No traffic lights. All I can say is good thing they've no longer got an exclusively socialized medical system over there for so long as the likes of Anne Milton and Andrew Lansley are at their health system's helm, that system's in big trouble.